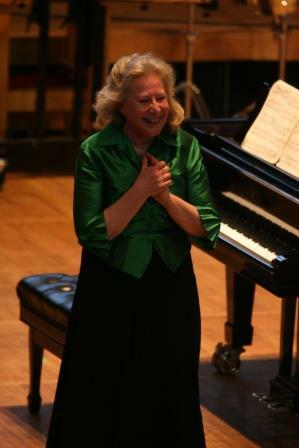 Former Bienen prof. Ursula Oppens will perform at Northwestern on Saturday. This will be her first time on campus since she was a member of the faculty. It’s homecoming for four-time Grammy nominee Ursula Oppens. The former Bienen professor will return to Northwestern on Saturday for a piano recital that will kick off the Skyline Piano Artist Series at the Bienen School of Music. Oppens, who was a Bienen piano professor from 1994 to 2008, will return to campus for the first time since being on faculty. Oppens will be playing three pieces that she commissioned for the recital. The piece “Four Hands” was written for Oppens and her partner, Jerome Lowenthal, a piano professor at the Juilliard School, to play at the same piano. Oppens and Lowenthal will perform the piece together on Saturday. Oppens performed the North American premiere, “Night Fantasies,” another piece on the program, more than 30 years ago in Pick-Staiger Concert Hall. Oppens recently re-recorded the third piece on the program, “The People United Will Never Be Defeated,” as well as “Four Hands” for Cedille Records, a Chicago-based label. Oppens said she’s proud that “Night Fantasies” and “The People United Will Never Be Defeated” have really entered the modern repertoire for pianists, she said. Bienen Prof. James Giles, who was a colleague of Oppens for many years, invited her to perform. Giles said he is looking forward to seeing Oppens and hearing her perform on Saturday. Giles said Oppens is “particularly versatile” and is known as an advocate for composers as well as somebody who’s really committed to expanding the repertoire by premiering new pieces. The recital will be held at 7:30 p.m. on Saturday in the new Mary B. Galvin Recital Hall.